Yesterday was a grey day so we started late and headed to the coast south of Sunderland. No photos so made for Tynemouth. Some sunshine here. Photos of castle, pier and Victorian station. Then on to Whitley Bay and St Mary’s Lighthouse which is joined to the mainland by a Causeway,returned here closer to high tide too. Spanish City too, a big white domed building. In the evening we drove in to Newcastle for some dusk and night shots. Started with the bridges over the Tyne then into the city for shots of Central Arcade, Grey’s monument, theatre, skyline from Tyne bridge and a few others. Forgot to take photos on my mobile so no pics until my films are processed. Today again started grey so another late start then walked down into Durham and along river for photos of cathedral. Waited about 40 minutes for some brightness, then the sun came out briefly. Made all the difference. It looked pretty set as a grey day so we decided to go for a walk. 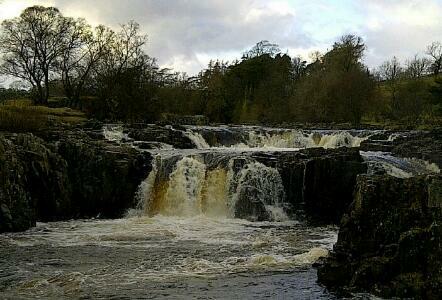 Teesdale is about an hour away and there are lots of waterfalls, great subjects for grey days. 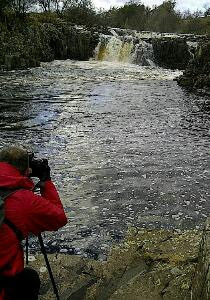 We walked about 5 miles in total, taking in High Force and Low Force. The photos here were taken by Jan, including me in one.